I’m not really an impulse book buyer. However, I am a chronic impulse book borrower. Last week, SuperWendy’s TBR challenge was to read an impulse buy and as I searched my burgeoning bookcases I realised that very few of the books I owned had been purchased without thought and planning. Each one seemed to have a back story. Either a review I had read, a cover artist I had admired, a recommendation from a friend or an award I wanted to consider. It isn’t as though I don’t purchase from bookshops. It is just that somewhere in the recesses of my mind I am hesitant to purchase a reading experience without having tried it out first. I have limited space in my small(ish) home and I also have a small(ish) book budget. Despite spending hundreds of dollars every year on my reading choices, these are more often for keepers as I cannot afford to make dud purchases. It made me realise how dependent on libraries I am for that serendipitous author discovery. The other week, I went to the library to pick up two reservations that had arrived, and I left with 22 other books which I am slowly getting through. This past week I have read two of my serendipitous impulse borrows. Just a quick warning for those of you who may not want to read about death, skip to the next book or just stop reading. 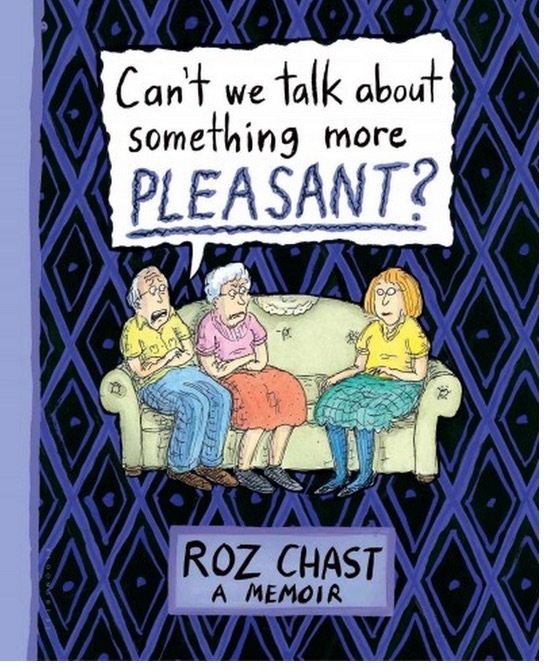 Roz Chast is a cartoonist with The New Yorker. Having grown up in Brooklyn, she moved to Conneticut when she was expecting her second child. However, her elderly parents continued to live in Brooklyn and as they entered their progressed through their 90s she found herself returning to the apartment she grew up in to take care of them until their increasingly ill-health necessitated their moving to a retirement home which Chast (and her parents) refer to as The Place. This graphic novel, traces those last years of understanding parent foibles, taking care of the people that have raised you and trying to make the right decisions for the ones you love despite their refusal to discuss their end of life desires. In my own Greek tradition (or at least in my family), talking about death and last wishes, though not dinner table talk*, is relatively open. I’m so open on these that I am even happy to list them here. If possible: donate my innards but not my body which needs to be washed with red wine (tis’ Greek tradition not a personal quirk! ), there is no way on earth that Baloubis the Phlegma Gang member from high school turned funeral director is allowed anywhere near my cold, dead corpse and if this is not respected I will haunt haunt haunt all those who thought it a good idea to hire him, to the funeral director who does get to bury me – my family and friends are more than welcome to haggle for a better price dammit!, I want an open casket (a warning to my indigenous friends) of untreated wood planks (no fancy schmancy polished wood velvet lining for me thankyouverymuch) for a burial so that worms can get in and break me up, an Orthodox service in the church I was christened and married in, the gospel reading in English all the rest in ecclesiastic Greek and absolutely no eulogy from anyone in the church, leave that for the wake after my internment and even then make sure it is a wake and not a celebration of my life, I want commiserating, I don’t want music in respect of my love for shhhhh!, I want a wake with crying and grieving that makes way to storytelling and hopefully laughter. And if all this is not possible, oh well. Life (and death) take their own paths**. Not all plans need to be adhered to as Chast shows in her book that making decisions around the care required by her parents during their sunset years is much more difficult when health and economic reasons narrows their choices or takes them away completely. I was deeply touched by this book. It made me look around my own (minor) hoarding habits and I spent all of Saturday clearing 3 of my cupboards of rubbish that my children will never need. My bins are full and my local op shop is about to receive a whole lot of board games and jigsaw puzzles that were taking up a ridiculous amount of space. I already feel happier. This is the power of writing. Thank you, Roz Chast. * I lied. These discussions have also been had at the dinner table. **Except I will NEVER travel the Phlegma Gang funeral director path. Occasionally, I want to return to reading literary fiction by male authors. I am so deeply embedded in women’s writing, I often feel as though I am missing out on “greats” of writing, those Nobel, Pultizer, Booker winners that were my reading mainstay 25 years ago and are still the books that receive accolades and reviews. I dip my toe in reluctantly. Often trying out a few chapters of a novel, but more commonly, I find their short stories, published either in literary magazines or in small collections. So, having never read any of JM Coetzee’s work, I borrowed this volume of very short stories (less than 20 pages each). I love short stories. The sparcity of words to deliver an understanding not only of the story but also of the elegance of an author’s wordsmithery, both serving as a threshold to the longer works of fiction for an author. Sadly, Coetzee’s short stories did not make me want to read more of his work, but instead, made me agitated and annoyed that he receives accolades such as the Nobel Prize for literature. There are so many female writers whose works are equal and/or surpass his in complexity and craft yet they do not get recognised. It just serves to lower my respect for, not only the author, but the awarding institution. His plan, at the beginning, was to spend two seasons of the year here. Summers he would avoid because they were too hot, winters because they were too cold. Plenty of men have marriages like that, he told himself. Sailors, for instance, spend half their lives at sea. If this is marriage, he tells himself, then it is a widow I am marrying, a mature woman, set in her ways. Just as I cannot be a different man, so I should not want her to become, for my sake, a different woman, younger flashier, sexier. Charmer. He’s so respectful of his house/wife. No mutton dressed as lamb for him. He likes his older women respectfully restrained and creaking. When one marries, one cares deeply who one’s wife was married to before, even who she slept with before. Hmmm. There are so many talking points here. I’ve already slipped into thinking that he cares only to judge her for sleeping with anyone before him but then again, that statement can also be thought of in terms of caring because I want to understand you as a person. This judgement point is not unique to men and it certainly is implied in a lot of romance fiction too. The whole “good girl” narrative continued into someone’s mature years (even if that someone is a house). So as a male point of view, once again we see the passing of wisdom words on to more men, who will bestow awards to these words, set them in some school curriculum and then all who will read them will nod and take them on as their own wisdom words to judge the women they might want to marry. I, the reader, understand this is an analogy. And just in case I am stupid, the narrator actually tells me that this is just an “…analogy between ownership and marriage, houses and wives…” (my use of this quote here is slightly out of context but it is not a misrepresentation). What it comes down to, astonishingly, is that he wants a relationship with this house in a foreign country, a human relationship, however absurd the idea of a human relationship with stone and mortar might be…..in return for that relationship he is prepared to treat the house as one treats a woman, paying attention to her needs and even her quirks, spending money on her, soothing her through her bad times, treating her with kindness. How kindly of our narrator to want to take care of a woman *ooops* house even if it does have quirks. As you can tell, I did not enjoy the “moral to this story is”. The writing was okay. It was fluid, cohesive but it didn’t enthrall me and neither did it stand out as different to so many other storytellers. The thing that annoyed me more than anything else was that I felt that I, the reader was being talked down upon. The reader is the lesser in this relationship. I, the reader needed to have lessons of life bestowed upon me and this was not done subtly or subversively but it felt as though the writer was telling me rather than showing me how he viewed life. I finished the other two stories in this short collection (all written before he received the Nobel) but they too left me unimpressed and doubtful that I will ever want to expend any time on a longer story by Coetzee. Both these books were borrowed from a NSW public library. Books that touch on hoarding always get a lot of crap out of my house. I really have to fight against the tendency. It sounds like a great follow up to the Chast would be _Being Mortal_, an amazing book that everyone should read. It’s about figuring out what people really need as they come to the end of their lives. Thanks for the rec. I’ll seek it out. Particularly if it helps me get rid of even more clutter. I think this is why library memberships increases for seniors. Not only are they retired and have more time to read but they also can’t bear to add more items into their home. Ooooh! That is cool. If I had cable TV, I would definitely be watching Hoarders. Oh the food is very important. No meat, lots of seafood and spanakopita and brandy. Cake is a no-no. Sweet is celebratory (CRY DAMMIT!). As for getting a plain wooden coffin – apparently Costco sells coffins but my thought is getting a carpenter to make one for me.